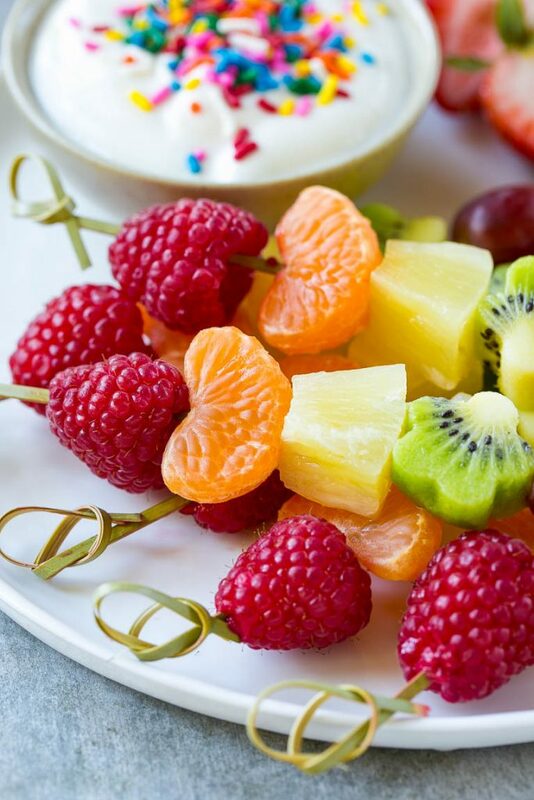 This recipe for fruit kabobs is a rainbow of fruit served on skewers with a yogurt dipping sauce. An easy and healthy snack that the kids will devour! Looking for a way to get the kids to eat more fruit? These fruit kabobs are always a hit and take just minutes to put together. My kids also love apple nachos and chocolate fruit dip. I’m always looking for new snack ideas for the kids. I’ve noticed that the pre-packaged snack options at the grocery store are often far from healthy, so I started making these fruit kabobs as an alternative. My kids ask for these fruit skewers almost every day after school – they love the flavor, and I love that they’re getting more nutrients! How do you make fruit kabobs? I’m always looking for ways to create healthy snacks that the kids will love, and these fruit kabobs definitely fit the bill. I picked up these decorative skewers at a party supply store; if you’re serving these to young kids, you can simply cut off the pointed end with kitchen shears. I like to put a rainbow of fruit on these skewers; in this case I used raspberries, clementine oranges, pineapple, kiwi and grapes. I used a small metal cookie cutter to cut the kiwis into fun shapes, but that’s completely optional. Other great choices would be strawberries, blueberries, bananas, green grapes, or even melon! 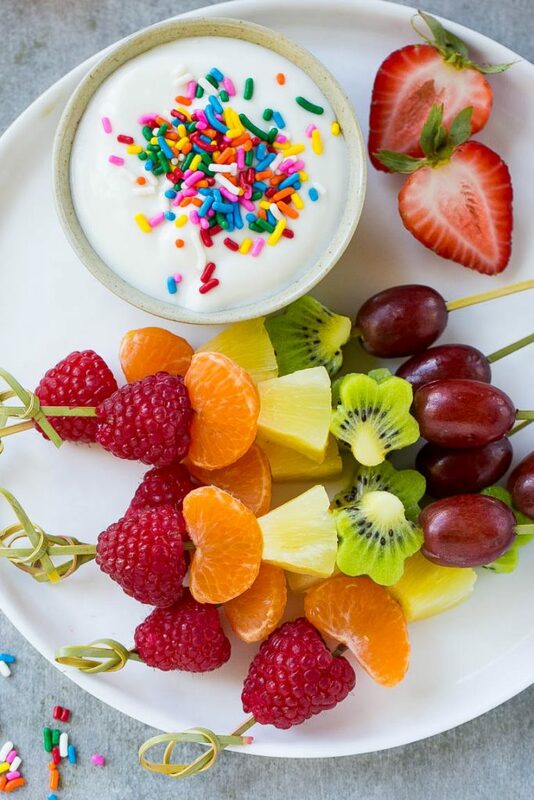 I serve these fruit kabobs with a simple dip of vanilla yogurt, topped with rainbow sprinkles for good measure. I’ve found my girls will eat anything if it involves sprinkles! 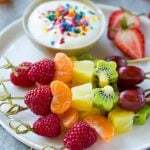 These fruit skewers are also perfect for parties; I served them for my youngest daughter’s birthday and they were a huge hit. I like to use Greek yogurt for the dip because it has more protein than regular yogurt, and I find that adding a little protein to snack time helps to keep my kids full for longer. This post is sponsored by SmartyPants Vitamins. Thank you for supporting the brands that make Dinner at the Zoo possible! 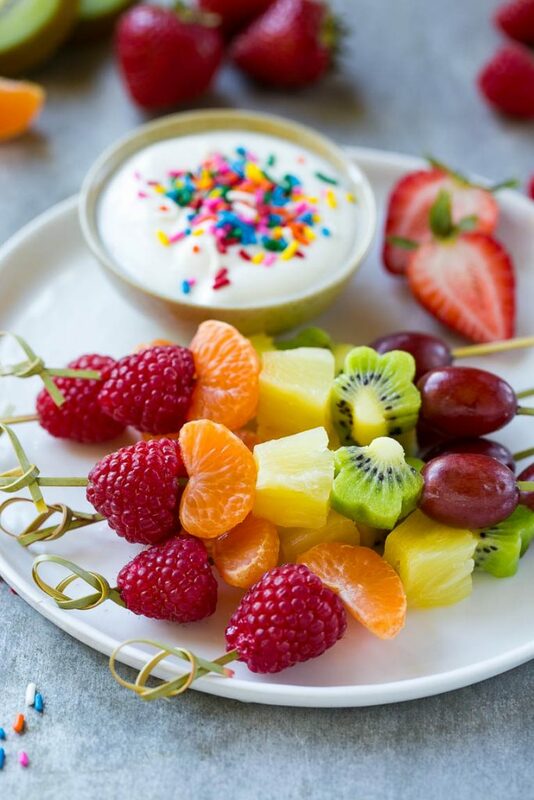 This recipe for fruit kabobs is a rainbow of fruit served on skewers with a yogurt dipping sauce. Thread a raspberry, orange, pineapple, kiwi and grape onto each of 12 small skewers. Place the vanilla yogurt in a bowl and top with sprinkles. Serve alongside the skewers for dipping. I make them for the grandchildren with whatever fruit I have. They think eating off the stick is fun! How long were the skewers? They were about 6 inches, you can use longer ones and just add more varieties of fruit or repeat the pattern with the same fruit! Great snack idea and what a beautiful vitamin model! The fruit kabobs look like a lot of fun. What a great healthy snack for kids or anyone. Beautiful skewers Sara – but your model is even more beautiful. What a doll! Going to check out these Smarty Pants chews for my grandson.